Bord Na Móna Growise Tub & Basket Compost is not suitable for ericaceous plants such as rhododendrons, azaleas and camellias. For this group of plants you should use Bord Na Móna Ericaceous Compost. Bord Na Móna Growise Tub & Basket Compost contains all the nutrients your plants need for the first 5-6 weeks in their new setting. From then on, feed them every 7–14 days. Bord Na Móna Growise Tub & Basket Compost is the best growing media for planting up containers. Nutrient rich compost plus extra moisture control create the perfect conditions for all containerised plants, maintaining steady, healthy growth all season. Baskets and containers can be a real eye-catching feature of gardens large and small. 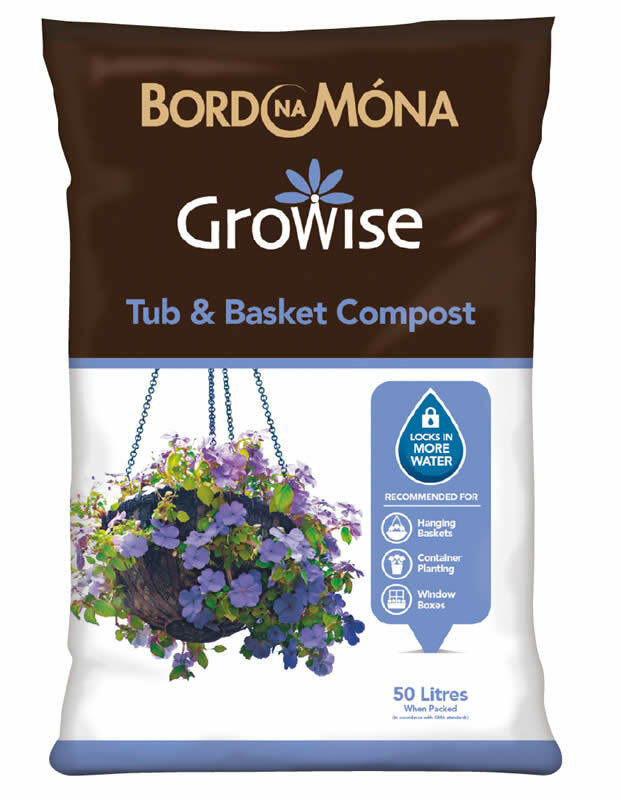 Bord Na Móna Growise Tub & Basket Compost is formulated to ensure you get the best results from your tubs and baskets all season long. Line the basked with an appropriate liner if required. After selecting the appropriate plant colour scheme, work through plant structure i.e. tall plants for centre, trailing plants at edges, as well as foliage and colourful plants to give the desired effect. Fill the basket with plants working the compost around the root systems one plant at a time. Water the basket thoroughly initially. Thereafter ensuring it does not dry out. Choose a pot or planter large enough to comfortably accommodate the plant roots. Check that there are sufficient drainage holes to prevent the plants becoming water logged. Partly fill the pot, place the plant in the pot ensuring that it sits no lower than it did in its previous container. Fill with compost, making sure there are no air pockets. Firm the surface lightly and water well. Ideally keep the plant in a shady position for a few days to establish itself. 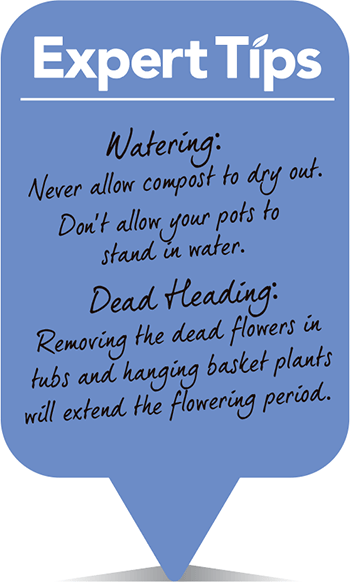 Water thoroughly and often and never allow the compost to dry out. Partly fill the new, larger pot with Bord Na Móna Growise Multipurpose Compost. Remove the plant from the old pot. Place the plant in the new pot, make sure the plant is at the same level as it was in the original pot and fill the pot with compost, firming lightly.